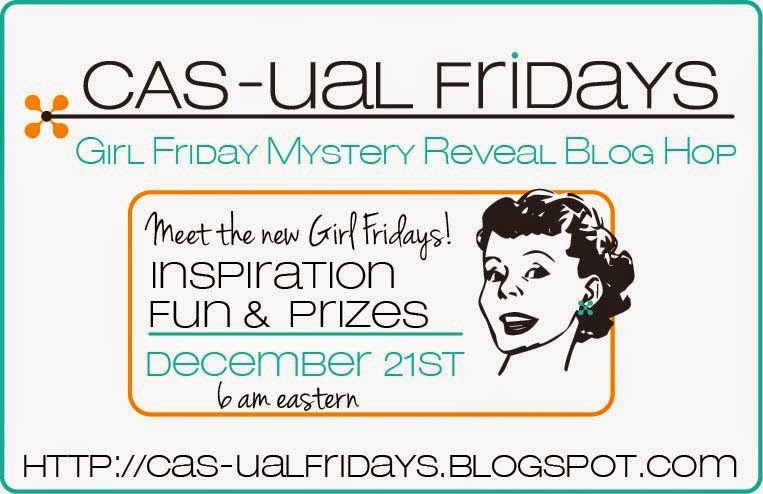 CAS-ual Fridays Stamps: The Girl Friday Mystery Reveal Blog Hop! The Girl Friday Mystery Reveal Blog Hop! Welcome to The Girl Friday Mystery Reveal Blog Hop! They have been sworn to secrecy for the past few months, and today they finally get to spill their beans! I'm so excited to finally get to introduce them!!! I'm so glad you agree!! So let's get this party started, shall we? In order to join the fun, you'll need to click on the link I'll give you at the end of this post which will take you to meet the first new Girl Friday and collect your first clue. meeting the team, gathering clues and leaving comments along the way for your chance to win prizes! Each new Girl Friday has a prize up for grabs! At the last stop on the hop, you'll have one more chance to win a prize by using the clues you've gathered to solve the mystery. Doesn't this sound like a sleigh full of fun??? The hop ends at noon on December 27th. Ok...Are you ready to meet the first new Girl Friday??? Oooh, I'm so excited to see who is on the team. And this blog hop is going to be fun of fun and surprises..... Off I go. This will be fun! Can't wait to see the new designers!! Sounds like a good time to have a cup of coffee and enjoy some creativity! Oh how fun. I LOVE a good mystery. I've been waiting for this since I saw your announcement and added the badge to my sidebar. tee hee hee. Wonderful Hop and great new team members! Off I go to gather clues. Thanks for the fun hop. It was impossible for me to leave a comment on Jessica's blog. What do we do with our clues? Fun hop - so the clue word is January - and now what? Great way to introduce your new team! Woo Hoo - off to get the first clue! This is an ingenius idea...you're such a clever girl. I'll be hoppin' now. This is going to be so much fun! Here I go! Sounds like great fun ! Woo hoo! This is so exciting! Such an awesome way to introduce your DT - off to hop and solve the mystery! What a fun way to win and meet some talented ladies, here I go and thanks for the chance to win. How fun, off to hop! Took me all day to finally sit down and hop. Off to join in the fun. It's sounds exciting. Seat belt fastened..I'm ready to hop! This is a great way to introduce the new challenge team. Off to hop and check it all out! What fun! This is an awesome way to get to see the DT and visit their blogs! Oooo . . . this is going to be fun. I starting now! OK, now that I've completed this great blog hop and enjoyed the announcements of the Girl Fridays, what do I do with the clues I gathered? Don't think you want it posted here to "share" with everyone else who reads it, do you? Looks like 2015 will be a good year for CAS-ual Fridays!